My life has been filled with so many of God’s blessings! Our parents, Jim and Wanda Kearney, welcomed each of their four daughters with great joy. We grew up in Sonoma, CA, when it was a small town located in the beautiful Valley of the Moon. 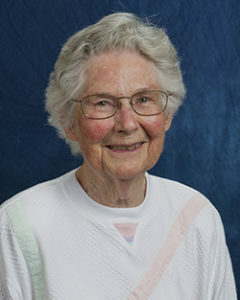 Our sister, Pat, graduated from Ursuline High School, and after one semester of college she left for St. Louis, MO with her classmates to enter the Ursuline novitiate. Our sister, Wyn, earned her degree in Nursing at Mercy Hospital in San Francisco. She married Ed McCambridge; they had three delightful children: Anne, Dan and Steven. Wyn developed cancer and died when the children were still so young. Then the youngest sister, Fran, was in her second year at College of the Holy Names, when God’s special invitation came to her. I spent eleven years teaching primarily with the San Diego City Schools—a truly marvelous school district with a superb teacher support system. I learned so much about working with children and learning from them. It was after this experience that I, too, entered our beloved Holy Names Community. Our parents were so supportive of our choices, even though they missed having us nearby. I began teaching part-time at College of the Holy Names and studying at the University of California at Berkeley. After completing the doctoral program in Teacher Education, I taught first grade at Old Saint Mary School in Oakland—a truly memorable experience! I returned to College of the Holy Names (now called Holy Names University) to teach and supervise student teachers for the rest of my teaching days. It was such a special experience to work with so many fine colleagues and strong future teachers. I will always be grateful to God for enabling me to be part of the teaching and learning process with children, students and colleagues.